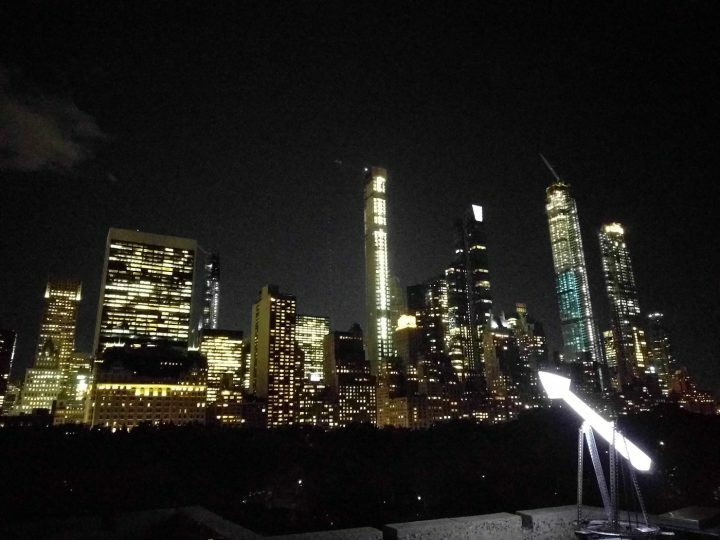 Sometimes in New York City, it’s hard to see the stars. Light pollution and towering skyscrapers blot out the view. But there is one astronomical object that always shines through: the moon. New York City’s waterways, including the Hudson River and East River, are part of a large tidal estuary that ebbs and flows with the gravitational pull of the moon. You can witness this in the changing currents of the East River, which, depending on the tides, sometimes flow northeast, other times flow south towards New Jersey. Boaters are familiar with these shifting tides, but for those of us on shore, we may rarely notice this phenomenon. To draw attention to this relationship between the urban landscape and outer space, Neilson created “Moon Arrow,” a sculptural arrow which continually points at the orbiting moon. 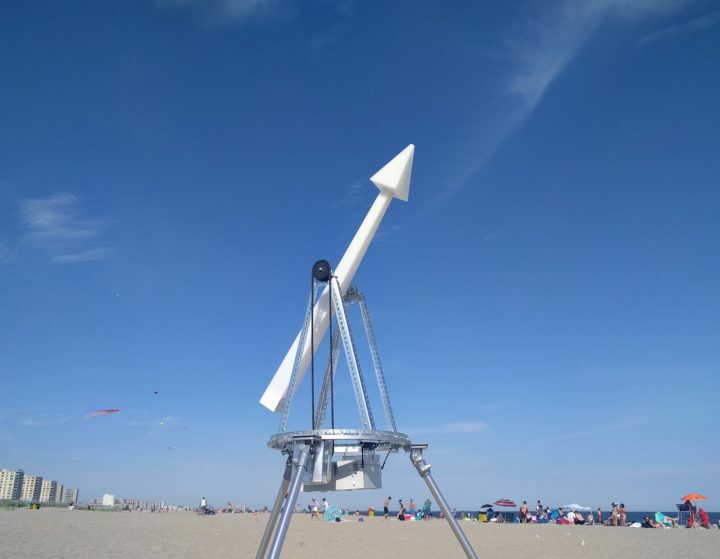 “It operates as a semi-static public sculpture that people are able to see occasionally move very slightly in real time, and I film it in time lapse to allow us to see a video revealing different paces of time: the motion of the arrow in relationship to the tides and relatively speedy activities of people,” Neilson explained. 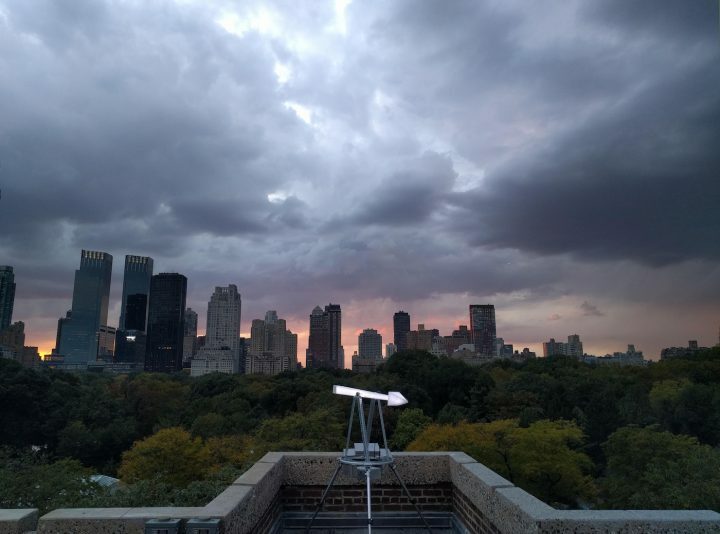 Her project developed out of her time as an arts and humanities resident with the New York City Urban Field Station; a residency program at Fort Totten Park in Queens launched in 2016 with the mission to engage with urban nature through the arts. Over this past summer, “Moon Arrow” popped up around the city, appearing like a way-finding sign by day, and an otherworldly beacon when illuminated at night. She collaborated with artist Marie Lorenz to transport “Moon Arrow” to a secluded industrial site along Newtown Creek. Lorenz’s ongoing Tide and Current Taxi rowboat project similarly engages with the tides. 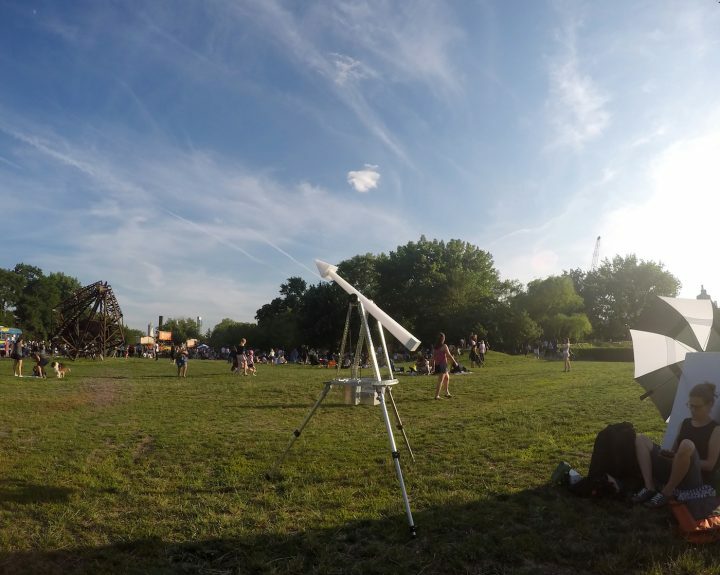 Neilson joined the Amateur Astronomers Association of New York at Hunter’s Point South Park of Long Island City, where, alongside the telescopes, “Moon Arrow” celebrated celestial action visible to the naked eye. 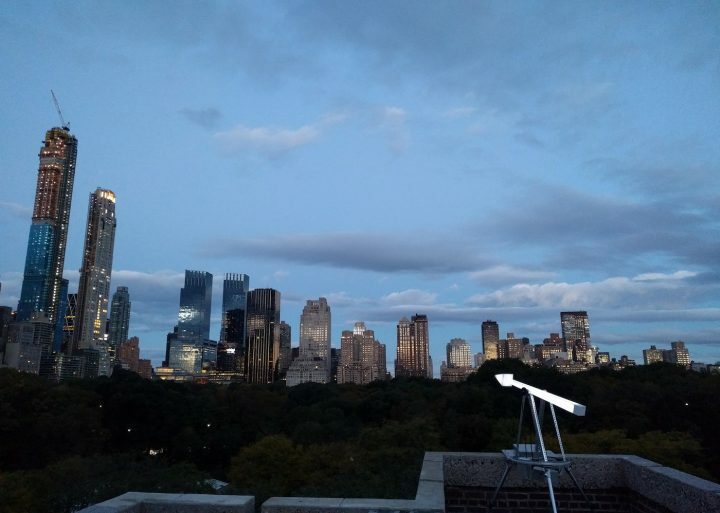 In October, she installed the sculpture on the roof of Central Park’s Arsenal Building, where it quietly followed the moon as it appeared above and vanished below the Manhattan skyline. Much of Neilson’s multidisciplinary practice considers our relationship to outer space, both as relates to momentous tides, as well as more speculative thoughts about our sense of place among the stars. For instance, her “Sonic Planetarium: Satellite Pipes,” on view through May 2019 as part of TuftsPUBLIC: Wave Farm in Residence at Tufts University in Massachusetts, involves seven hanging silver cylinders that channel real-time audio representing satellites and other orbiting objects that are currently within radio transmission range. Meanwhile, the 2014-16 “Menu for Mars Supper Club,” co-organized with Douglas Paulson, involved a series of dining events at restaurants around New York City exploring food that could be prepared on Mars. Although “Moon Arrow” is on hiatus for the winter, Neilson is continuing and expanding the project, with future events shared on its dedicated site (and Twitter @moonarrownyc). 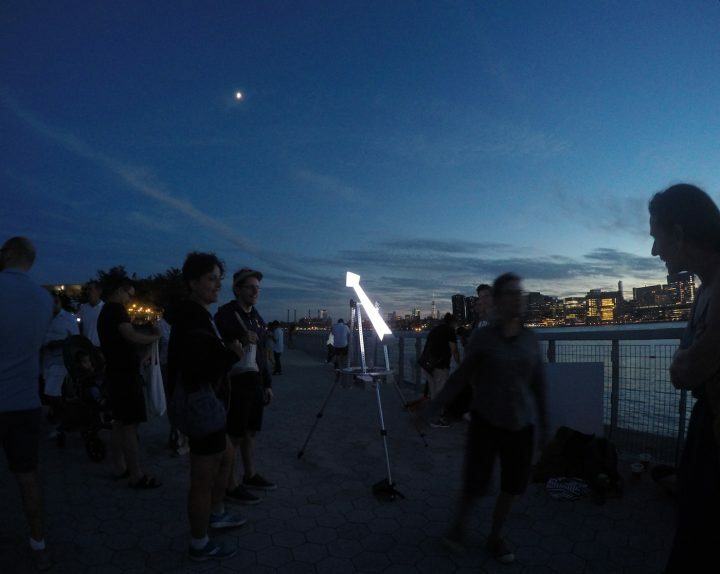 While “Moon Arrow” was initially designed to be battery operated for off-the-grid places such as Brooklyn’s Calvert Vaux Park for a horseshoe crab monitoring session, or Rockaway Beach when it joined the Urban Park Rangers for new moon stargazing, she’s working on a version which could be installed longterm. She’s also planning a whole set of arrows which would point to the various planets in our solar system, creating a “contemporary orrery.” As it develops, “Moon Arrow” will continue to challenge our perception of how astronomical forces influence our daily lives, and remind us of this heavenly energy constantly acting on our landscape. Details on Heidi Neilson’s “Moon Arrow,” including upcoming events, are available on its dedicated site.